I installed a working openvpn server according to the previous tutorial. Now I cannot follow this tutorial. 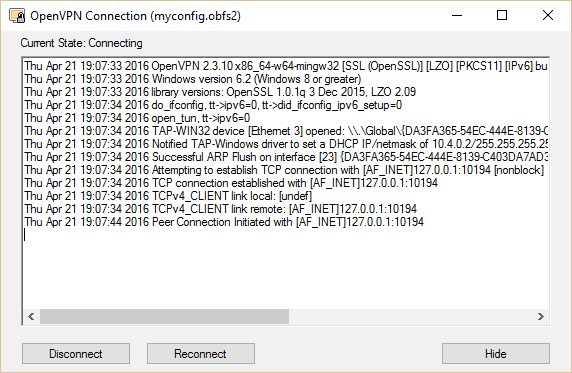 1) What is the ovpn.key file in the new client config file? 2) Does this mean we do not need the rest of the client files? client.crt, DH2048.pem etc? Apologies as this is probably a bit confusing. 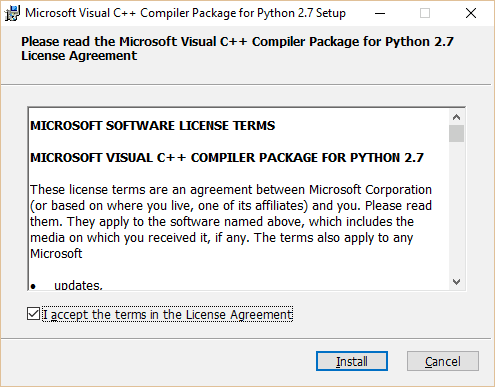 This tutorial was written following the older version of the previous tutorial. Notice the previous tutorial has two methods: a recommended method and the easy method. The recommended method was added after this article about obfsproxy was written, so some things might not match up. I would recommend using the easy method in the previous tutorial if you want to jump straight into this one. Hard to say without seeing any log files, and to be honest it’s been a long time since I wrote this and have since terminated the EC2 instance that I used to create this tutorial. But I imagine there’s a port mismatch somewhere or a port is being blocked by the server firewall. Use iptables or the EC2 security groups to open all the relative ports and check to make sure the correct port is being set in the proxy extension. I am trying to set up OpenVPN server with Obfsproxy. I am using Obfsproxy 0.2.13 on both sides (server and client). So basically, server is listening to port 8080 and relaying all connections to 443 TCP where they are taken over by OpenVPN. Now the client side (Ubuntu 17.04). 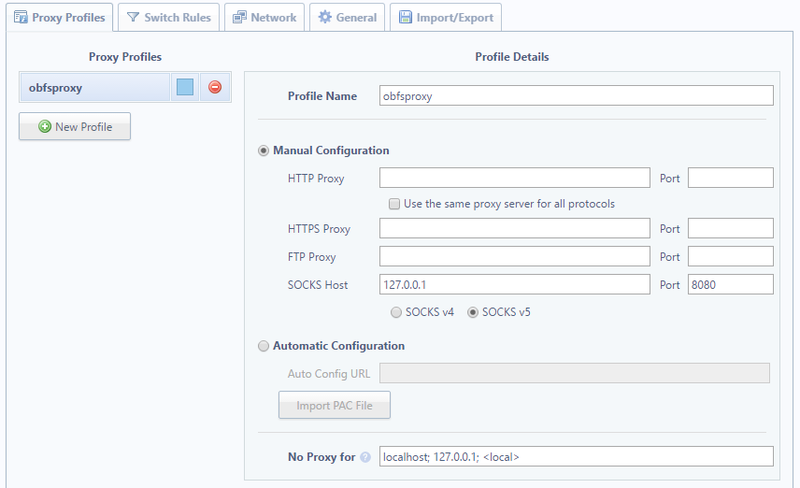 So basically, Obfsproxy is connecting to my server to port 8080 and opening socks on client’s localhost on port 10194. Now the problem is, that when I run OpenVPN client, it can’t connect and the problem is in Obfsproxy client. Do NOT rely on ScrambleSuit for strong security! 2017-09-26 19:54:16,672 [DEBUG] Setting the state location to `/tmp/scramblesuit-client/scramblesuit/’. 2017-09-26 19:54:16,673 [DEBUG] socks_fact_0x7fc077f6b2d8: Starting up SOCKS server factory. 2017-09-26 19:54:16,673 [INFO] Launched ‘socks’ listener at ‘[scrubbed]:10194’ for transport ‘scramblesuit’. 2017-09-26 19:54:54,126 [DEBUG] socks_fact_0x7fc077f6b2d8: New connection. 2017-09-26 19:54:54,126 [DEBUG] Initialising ScrambleSuit. 2017-09-26 19:54:54,126 [DEBUG] Switching to state ST_WAIT_FOR_AUTH. 2017-09-26 19:54:54,126 [DEBUG] Initialising AES-CTR instance. 2017-09-26 19:54:54,126 [DEBUG] Dumping probability distribution. 2017-09-26 19:54:54,127 [DEBUG] Dumping probability distribution. 2017-09-26 19:54:54,161 [DEBUG] circ_0x7fc077f845a8: Setting downstream connection (socks_down_0x7fc0781d9710). 2017-09-26 19:54:54,161 [DEBUG] circ_0x7fc077f845a8: Setting upstream connection (socks_up_0x7fc0781eab90). 2017-09-26 19:54:54,161 [DEBUG] circ_0x7fc077f845a8: Circuit completed. 2017-09-26 19:54:54,161 [DEBUG] Attempting to read master key and ticket from file `/tmp/scramblesuit-client/scramblesuit/session_ticket.yaml’. 2017-09-26 19:54:54,161 [DEBUG] File `/tmp/scramblesuit-client/scramblesuit/session_ticket.yaml’ does not exist (yet?). 2017-09-26 19:54:54,161 [DEBUG] No session ticket to redeem. Running UniformDH. 2017-09-26 19:54:54,162 [DEBUG] Creating UniformDH handshake message. 2017-09-26 19:54:54,176 [DEBUG] circ_0x7fc077f845a8: upstream: Received 88 bytes. 2017-09-26 19:54:54,176 [DEBUG] Buffered 88 bytes of outgoing data. 2017-09-26 19:54:54,185 [DEBUG] socks_down_0x7fc0781d9710: Recived 0 bytes. 2017-09-26 19:54:54,186 [DEBUG] circ_0x7fc077f845a8: downstream: Received 0 bytes. 2017-09-26 19:54:54,186 [DEBUG] Unable to finish UniformDH handshake just yet. 2017-09-26 19:54:54,297 [DEBUG] socks_down_0x7fc0781d9710: Recived 652 bytes. 2017-09-26 19:54:54,297 [DEBUG] circ_0x7fc077f845a8: downstream: Received 652 bytes. 2017-09-26 19:54:54,297 [DEBUG] Attempting to extract the remote machine’s UniformDH public key out of 652 bytes of data. 2017-09-26 19:54:54,297 [DEBUG] Could not find the mark just yet. 2017-09-26 19:54:54,297 [DEBUG] Unable to finish UniformDH handshake just yet. 2017-09-26 19:54:54,298 [DEBUG] socks_up_0x7fc0781eab90: Connection was lost (Connection was closed cleanly.). 2017-09-26 19:54:54,298 [DEBUG] socks_up_0x7fc0781eab90: Closing connection. 2017-09-26 19:54:54,299 [DEBUG] circ_0x7fc077f845a8: Tearing down circuit. 2017-09-26 19:54:54,299 [DEBUG] socks_down_0x7fc0781d9710: Closing connection. Is this problem somehow connected with warning about session_ticket.yaml? Directory /tmp/scramblesuit-client/scramblesuit/ on a client exists, but is empty. It should work without the browser (see other comments). Tbh it’s been so long since I wrote this and I’ve since terminated the instance I used to create it, so I won’t be much assistance. I may take another swing at this to see how it can be improved at some point in the future but it’s not a priority at the moment. Thank you for the tutorial. I’ve been able to get OpenVPN+Obfsproxy working, but the browser proxy is not working, and I’m not sure I understand why it would work. We’ve set up obfsproxy on the server end to forward everything coming in on 8080 to 1194, but 1194 is the vpn server. It doesn’t have any idea what to do with normal web traffic coming at it. Maybe there’s some iptable route that’s missing? 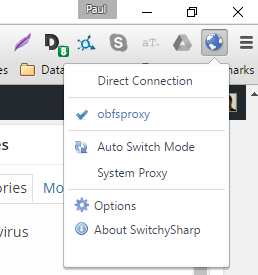 why change the proxy settings in browser since openVPN put all internet traffic through it? Hello Mr Paul this arcticle is wonderful How can we use this on IOS? I haven’t tested obfsproxy on mobile. I’m not sure if there’s a way to do it on iOS. Thanks for the heads up. I’ve updated the link. HI, this work from a openvz severs? I ran the Public ip for open ports online at it seems that only port 21,22,23 & 80 are open from my isp. Now how can i connect to openvpn server? Any reverse Openvpn, ssh etc. I tried PrivateTunnel, which has option for http and obfs proxy. When I select obfs proxy, Netflix still can detect that I’m using VPN. Do you know why? 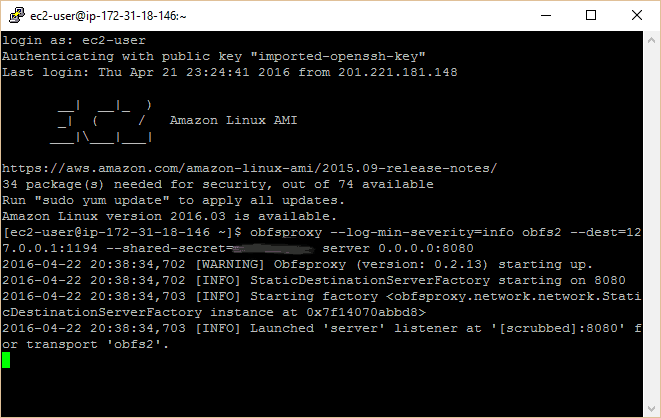 Do you think PrivateTunnel’s obfs proxy doesn’t work or Netflix found a way to detecting obfs proxy? 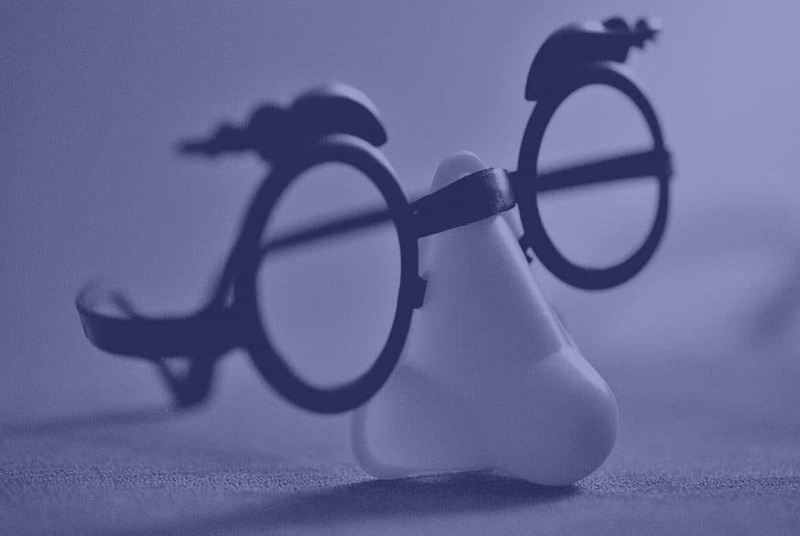 Obfsproxy by itself won’t unblock Netflix, but it allows you to port forward your traffic, which is why you need to use it in combination with ProxySwitchy or a similar browser extension. 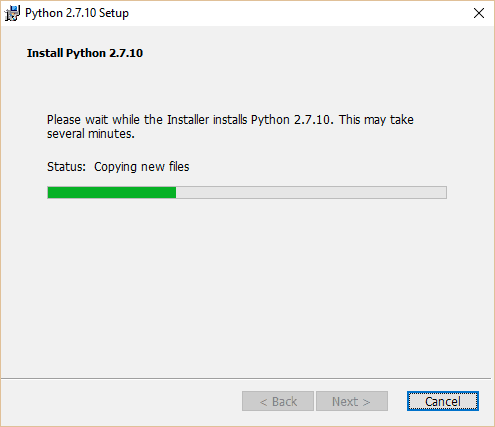 Can you show or publish a tutorial for how to do the same thing on Raspberry Pi. I have successfully setup OpenVPN Server on my Pi and would like to know how to obfuscate it. I don’t have a Raspberry Pi to test this with at the moment, but we’ll consider it for a future tutorial. At any rate, installing OpenVPN and connecting to servers via a terminal in most Linux distros is easier than on Windows. This doesn’t seem to be working anymore. At least not from Canada. I might be that I’m going through an AWS EC2 instance. Maybe they block those IPs? I tested it a couple days ago (after you posted this comment) and it was working fine for me, but I suppose it’s possible they blocked your IP and not mine. If you simply reboot the EC2 instance, you will get a new IP address, assuming you don’t have an elastic IP set up. Make sure you make all the necessary changes in your OpenVPN config to go with that. I went back and looked at the setup and now I remember why I use the socks proxy on a browser. That step is necessary if you want to use obfs to watch Netflix from outside the US. If you don’t, Netflix will be set to the wrong region. I’ve added a note to clarify that step being optional.